COLUMBIA, S.C. (AP) — Democratic presidential hopeful Pete Buttigieg told voters Saturday that his marriage to his husband exists "by the grace of a single vote on the U.S. Supreme Court." Sen. Bernie Sanders has a message for Kamala Harris: He's going to win her home state of California. 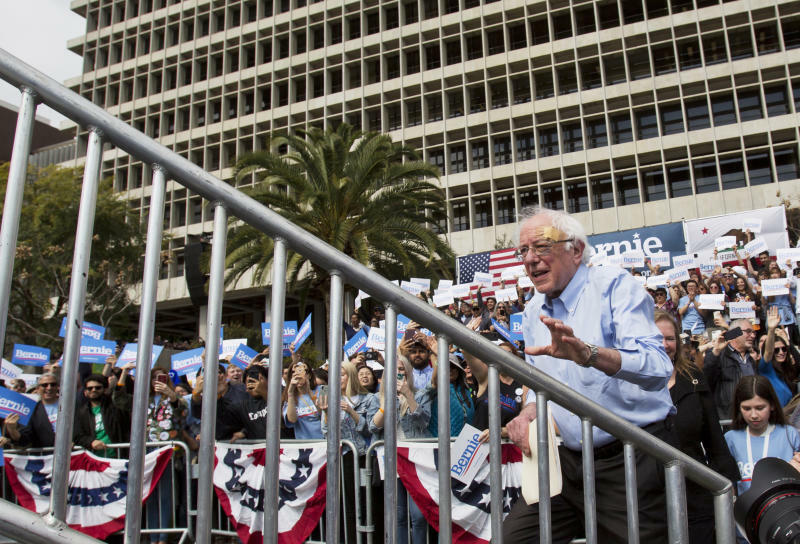 The Vermont senator made the boast during an outdoor rally in downtown Los Angeles that attracted thousands of cheering supporters at a city park and lined the steps of City Hall. Sanders, who finished behind Hillary Clinton in California's 2016 presidential primary, is on a campaign swing through San Diego, Los Angeles and San Francisco. His voice echoing off downtown buildings, Sanders told the crowd that "our job is to complete the revolution we began" in his first campaign. He ticked through now-familiar proposals, including universal health care, bridging the wealth gap and legalizing marijuana at the federal level. He said that while President Donald Trump is dividing the nation, "we are going to bring our people together." Sanders' early visit to California is a sign that he plans an aggressive campaign in the state, the biggest prize in the 2020 primary. Standing in the crowd, Marcus Mason, 24, a writer from Los Angeles, said he backed Sanders in 2016 and is strongly leaning his way again. With him, Sanders' signature proposal, Medicare-for-all, is a personal one: He sometimes lost his insurance moving from job to job. "I'd rather pay those taxes" for a larger, inclusive health care system, Mason said. New Jersey Sen. Cory Booker said during a stop in South Carolina that he was "a little bit worried" about how the issue of reparations was being discussed during the presidential campaign. 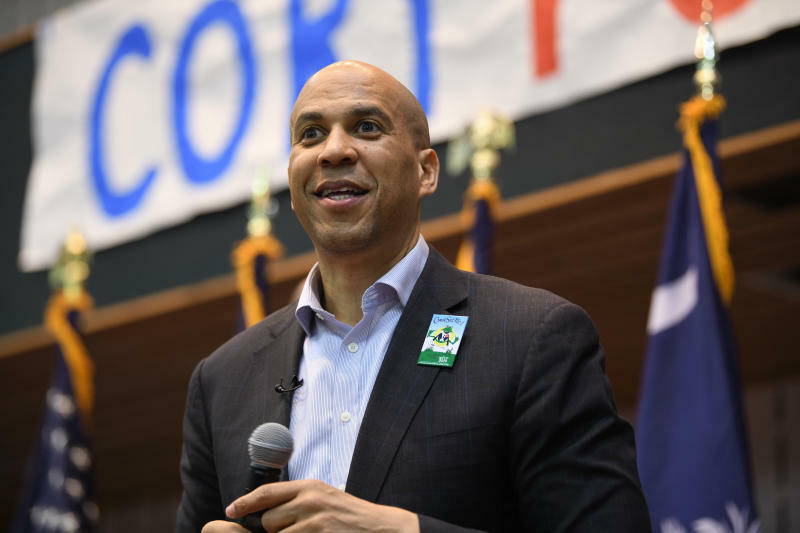 Booker told people crowded into a barbershop in Rock Hill that it was time to discuss the "persistent reality" of racism in this country, rather than worrying about how to handle a specific plan on reparations. Several candidates in the sprawling Democratic field have called President Donald Trump as a racist. Some have voiced support for the idea of reparations for the descendants of enslaved black Americans. Booker, who announced his candidacy at the start of Black History Month, has said it is time to recommit to the fight for justice in America. Massachusetts Sen. Elizabeth Warren confronted the topic of climate change during a campaign stop in Berlin, New Hampshire, saying the government is badly out of sync is with the future of America. "We're not spending money on infrastructure right now, we're not even repairing what's falling apart in infrastructure, much less building an infrastructure for the 21st century, much less hardening an infrastructure against the kind of change that is coming in our direction," Warren said. The presidential contender railed against "giant drug companies" and emphasized a message of economic equality during her speech. Warren later praised the idea of the Green New Deal, saying she wanted to make a strong pitch in favor of it to voters. "We've got to have a goal that we're headed toward," she said. California Sen. Kamala Harris introduced her first policy proposal since officially launching her 2020 campaign: a significant federal investment in teacher pay. At a Houston rally, Harris pledged that by the end of her first term she would close a pay gap that she said amounts to teachers making about $13,000 a year less than other college graduates. Her campaign is citing a study from the liberal-leaning Economic Policy Institute that found what's called the "teacher pay penalty" — the difference in compensation for teachers and comparable public workers — is larger than ever. The Economic Policy Institute study puts the teacher compensation penalty at a record-high 11.1 percent in 2017. During a town hall in Rye, New Hampshire, Minnesota Sen. Amy Klobuchar defended John McCain, the deceased military veteran and senator who has been the subject of scorn from President Donald Trump. Klobuchar called McCain her friend and said Trump's "ranting and raving" about the Arizona Republican led her to remember the last time she had seen the Arizona Republican, who ran for president in 2000 and 2008. Klobuchar and her husband visited McCain and his wife at their ranch. McCain was having trouble speaking, she remembered. He found one of his books and pointed out a quote to Klobuchar. "There is nothing more liberating than fighting for a cause larger than yourself," the quote read, she said. Trump, she said, doesn't understand that sentiment. 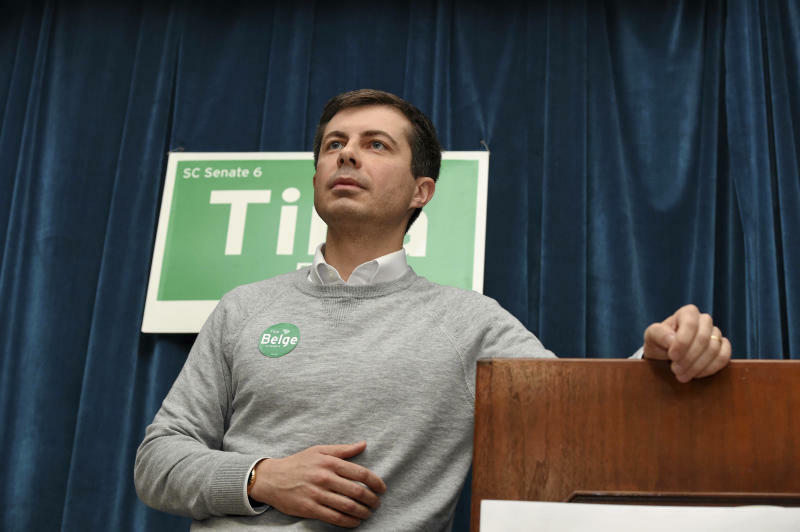 At a stop in Greenville, South Carolina, Buttigieg told a crowd that his candidacy may seem unlikely, but added that maybe it was time the party nominated a millennial from a red state. He acknowledged the more "traditional" route to the White House is to spend years in Washington before running. But he said the country "would be better served if Washington started looking more like our best-run cities." Buttigieg said that as a millennial he has a greater stake in the future of the country and more urgency to tackle issues like climate change. O'Rourke decried the Trump administration's attempt to add a citizenship question to the 2020 census, telling voters packed into the living room of a suburban Las Vegas home Saturday night that people, including those in the city's Latino and immigrant communities, should not live in fear and that "everyone should be counted, regardless of status." The former Texas congressman also praised Sanders, telling reporters that he's glad the Vermont senator is also seeking the Democratic nomination. O'Rourke said the country "owes so much" to Sanders "for his persistence and leadership to move the country closer to embracing universal health care." O'Rourke, who has called for the legalization of marijuana nationwide, recounted how he drove past the city's legal marijuana dispensaries on the way into down and questioned, "Why are we still arresting and jailing people for that substance in other states?" Woodall contributed from Littleton, New Hampshire. Associated Press writers Meg Kinnard in Rock Hill, South Carolina; Juana Summers in Washington; Michelle L. Price in Las Vegas and Paul J. Weber in Houston contributed to this report.